A former footballer has found the FA Cup winner’s medal he had reported stolen in a burglary. Ipswich Town hero Mick Lambert thought he had lost his prized possession in a raid on his house on 18 January, when a car and jewellery were also taken. But Suffolk Police said he had “come forward to say one of the items originally thought stolen has now been located”. Mr Lambert, 68, earned the medal in Ipswich’s 1978 victory over Arsenal. 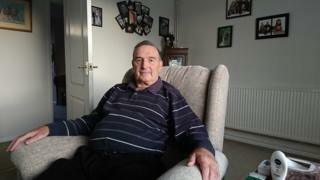 He and his wife Margaret, 66, arrived home to find burglars had broken into their property between 18:00 and 19:45 GMT. The raiders took a white Ford Fiesta, a TV and jewellery of sentimental value. The couple’s passports also went missing, prompting them to postpone a planned holiday to the Caribbean. At the time, Mr Lambert said the medal was a reminder of “the greatest day of his life”. “It’s the one thing you have that other people don’t,” he said.